This has been an amazing first week for the Teal Band. They shared stories about themselves, talked about what it means to be a supportive band member, agreed to take pride in their band space by caring for it, challenged themselves to send messages by air, and so much more. The Teal Band showing off their personality and their “new” band space. On day one we watched Angela Lee Duckworth’s Ted Talk, Grit: the power and passion of perseverance, and defined what it means to have grit for each of us. 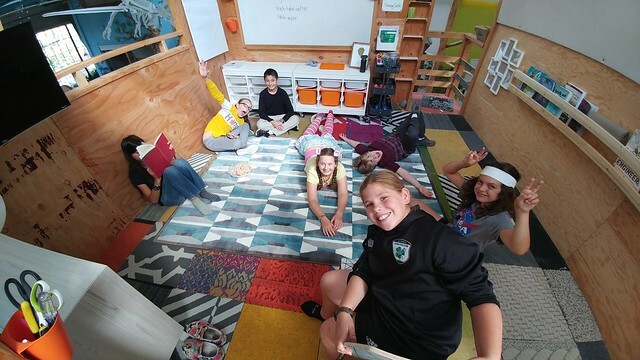 We discussed our thoughts around a quote taken from a 5th grader at UCDS (the school in Seattle that hosted the math workshop a number of collaborators attended this summer): “It’s only failure if you do not learn from it.” They shared stories of times they ran into challenges in previous projects. Challenges that may had felt initially like failure, but turned into successes because they chose to learn from their mistakes instead of giving up. Grit will continue to be at the center of many of our discussions and will play a big part in how we will challenge ourselves and one another this year. 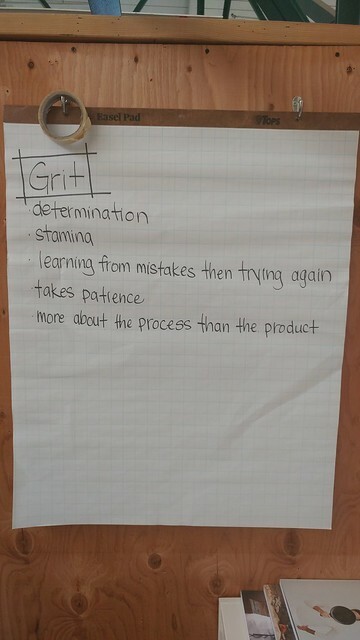 Teal Band’s definitions of what grit is. 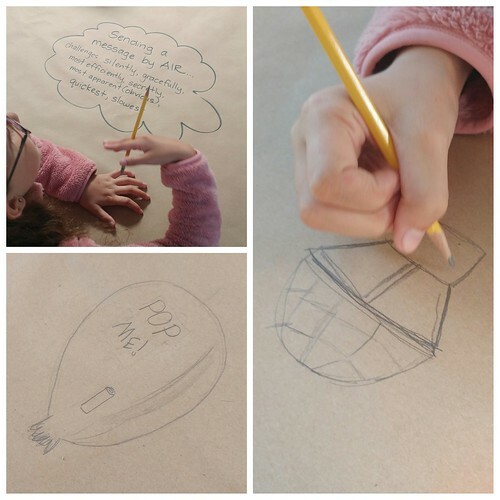 On Wednesday, we had a bit of fun (and food) with a design challenge. The Teal Band was tasked with sending each band in 1960 a message by air telling them that they would be receiving a popcorn treat at the end of the day. 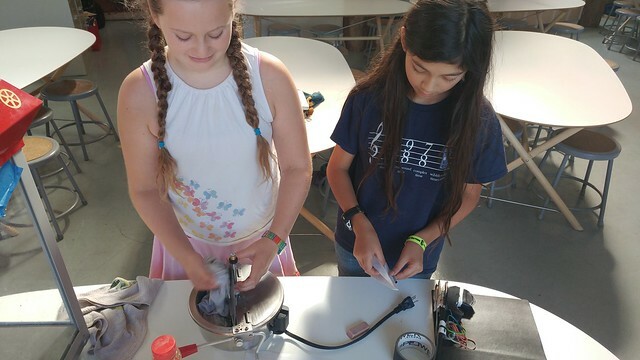 There were attempts at “hot air” balloons, ziplines, paper airplane flinging rubber band guns, ping pong ball launching shopvacs, and falling balloons asking to be popped. There were successes and there were challenges. In the end everyone was happy to have popcorn and the Teal Band had something to reflect on on Thursday morning. Visual brainstorm of ways to send other bands messages by air. Working as a team to prep the popcorn machine and find ways to send messages about the tasty treat. Gever shared with Orange and Teal, his vision of the arcs while I finished popping the popcorn. 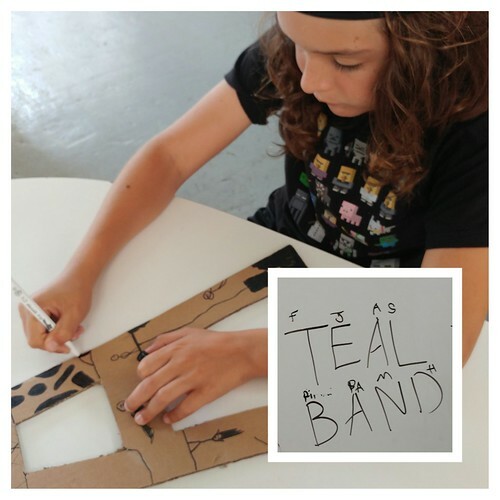 The Teal Band truly proved how strong of a team they already are when it came time to picking letters for each member of the band to decorate for our band space sign. They took charge of figuring it out as I cut out letters down in the shop. Some students stepped up, by stepping down when others wanted the same letter and kindly allowing them to “just have it.” Sometimes they had to ro sham bo. The one thing that never occurred was conflict. The sign is still a work in progress, but each letter certainly expresses each band member’s personality and design aesthetic. Adding some flair to exterior of the band space with our band name. 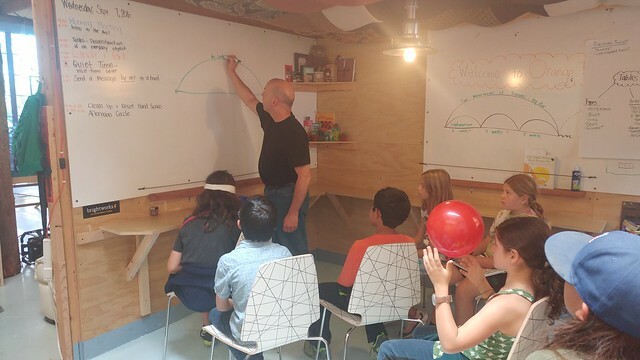 We finally wrapped up our week with a brainstorm around our arc topic of The Movement of Things By Air. This was saved till the very end of the week to give them the space to bond as a band, before becoming engrossed in the actual arc exploration itself. 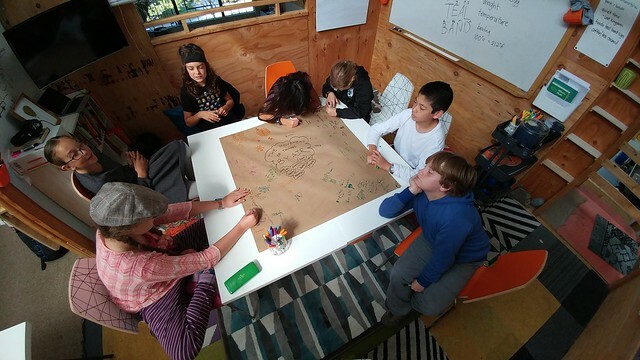 There were so many incredible ideas: Benjamin Franklin, hot air balloons, gliding vs. flying (flying squirrels vs. birds), helicopters, carrier pigeons, bacteria, air traffic controllers, flying cars, air hockey, combustion engines. Next week we will be focusing on kites, the history of them, the geometry of them, building them, flying them, writing about them, all while continuing to flush out what it is we want to learn this arc. Brainstorming what we are interested in studying this arc on the The Movement of Things By Air. Be prepared to have “Let’s go fly a kite” stuck in your head all next week! I know I will. 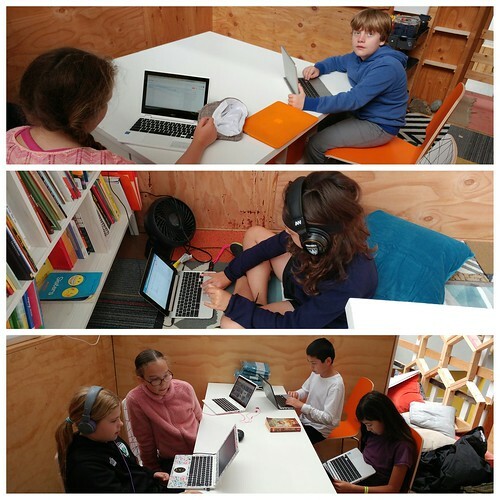 This entry was posted in Teal Band and tagged Angela Lee Duckworth, arc: By Air, brainstorm, Grit, popcorn, Teal Band. Bookmark the permalink.